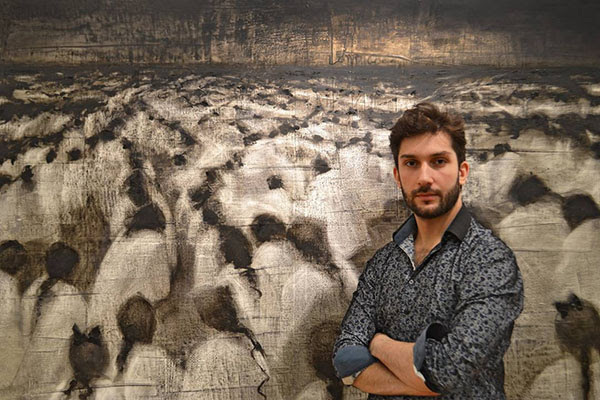 Levan Songulashvili (b.1991) is a Georgian-born New York-based visual artist; painter, draughtsman, installation and multimedia video artist. Inspired by western culture, German and French philosophy and psychoanalysis, his award-winning works and multimedia installations are shown in art galleries, private collections, and museums worldwide. Over the years, Songulashvili’s works were selected for the permanent collection of The Brooklyn Musuem, New York and The Rustaveli National Theatre. Songulashvili has won several merit scholarships as well as national and international art prizes. He was the first Georgian artist to earn his Master’s (M.F.A.) degree with honours from the New York Academy of Art (founded by Andy Warhol) in Painting, and became the TA for the ‘Art & Culture’ M.F.A. course at the same university. He has also collaborated with Turner Prize-winning artist Jeremy Deller, American rock star Iggy Pop, Japanese fashion designer Issey Miyake; his works has been exhibited alongside pieces by Egon Schiele, Jean-Michel Basquiat, Marina Abramović, Spencer Tunick, Yoko Ono, Odd Nerdrum and among others.